Gucci is one of the most iconic and well-known luxury personal goods brands in the world. 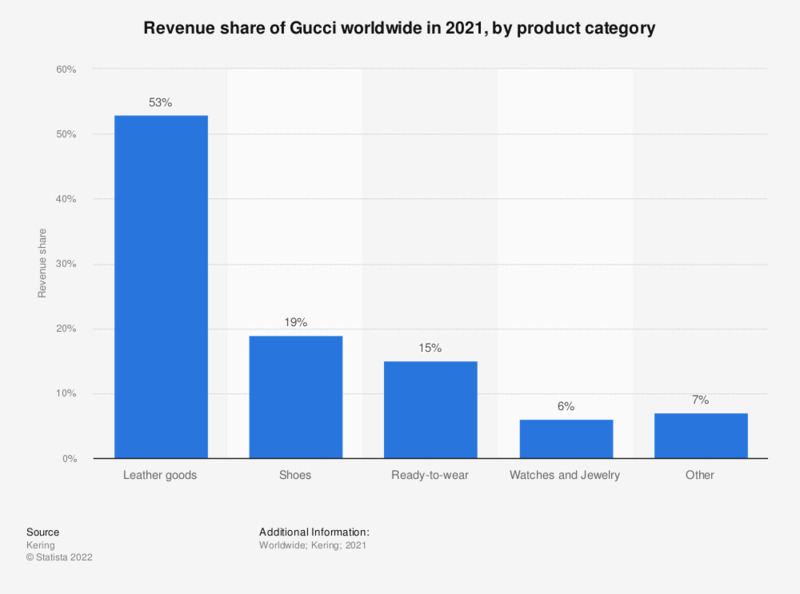 Gucci offers a range of different luxury fashion products, with almost 60 percent of the brand’s worldwide revenue coming from the sale of leather goods as of 2018. Shoes, ready-to-wear apparel, watches, and jewelry are the other main product categories of Gucci, however they also sell other products such as perfume and home décor. How did Gucci’s product line develop? Gucci was founded in Florence, Italy in 1921. The company started out as a leather goods manufacturer, dealing primarily in the sale of leather bags to people travelling on horseback. As methods of transport changed, so too did Gucci’s product offering. The company started making luxury luggage and later added ties, shoes, and handbags to its product line. Gucci products turned into status symbols as many famous people started wearing them. Nowadays, many more products, such as eyewear, belts, furniture, and various other consumer goods are sold under the Gucci label. Gucci is one of the most valuable luxury good brands in the world. The company has changed ownership on a few occasions and is now part of the Kering Group. Gucci is the most well-known luxury fashion brand in the United States.